Sunscreen that is safe for you, the ocean and its sealife. 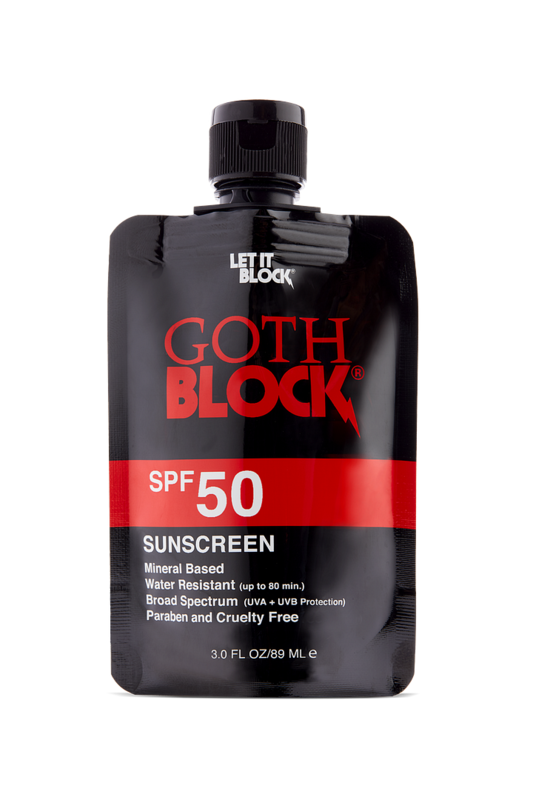 GOTH BLOCK SPF50 is a mineral-based sunscreen that comes in a convenient, very packable pouch (think juice pack with a cap!). The eco-friendly, recyclable package is a smart delivery system – easy to feel how much you have left and easy to squeeze out that last drop of sunscreen. The broad spectrum cream is formulated with plant oils and extracts for skin soothing and anti-aging effects, and it’s fragrance free, non-greasy and goes on without that dreaded, white ghost-like tint. We especially like that it’s designed for us active TrailblazerGirls with a water resistance of up to 80 minutes and doesn’t irritate our eyes when we get a little sweaty. It’s cruelty-free, vegan, and free of parabens. Plus, all the active and inactive ingredients are non-toxic and reef-friendly. Sun protection in a pouch with GOTH BLOCK!